There are actually more FSO requirements than you’ll find on the official Department of State’s website. And sadly, many FSO potentials have done a lot of incredible work and only found out later that they wouldn’t meet the standards, even though they passed all the tests. Therefore, I wanted to shed a little bit of light and add some aspects that aren’t exactly evident if you were to read the State Department’s website. You must be a U.S. Citizen with a valid birth certificate and social security number. You must be 20-59 years old on the day you submit your package. 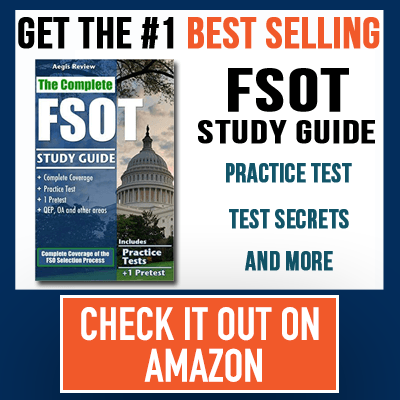 You cannot have been an FSO before and removed. 1,2, and 4 seem straight forward. However, 3, and 5 are not. What exactly does that mean? Well, in truth, it’s about your medical health and your security capability. To learn more about these to clearance checks, I recommend you check my articles on passing the security clearance, and the medical clearance. But in short, the State Department needs to know that you can take on any assignment no matter the climate, health condition or security status. What do I mean by this? The State Department doesn’t want to invest money into your training, only to find out you have conditions that won’t allow them to send you to places. China is both a health risk and a security risk. If you have debt problems or anything that the government can exploit, you’ll be a high risk person. Furthermore, the smog in that city is so poor that anyone with Asthma will have incredible problems breathing. Is China a 1st world country, yes. But does it provide challenges for some people, absolutely. Therefore, the medical and security check are to ensure that you can be deployed to places like China, Sudan, Haiti and other places. Make sure you spend adequate time reading my articles on the security check process and the medical check process so that you’ll have a better understanding of how rigid these looks are and what truly is in the FSO requirements. Just because you live fine in the U.S. and have no abnormal conditions, doesn’t mean you’ll pass the medical screening. In order to do that, you would have to be fine for places like Sudan and Ethiopia. Also, your security check needs to ensure you have nothing that would make you a liability. No high debt-to-income ratios, no foreclosures, no past acquaintances from countries who we are not on good terms with. This may sound strict but try to understand how important it is that the State Department ensure that those coming in are ready for any job given.